A recession is defined as a period of negative economic growth. However, there can be different causes and types of economic contraction. 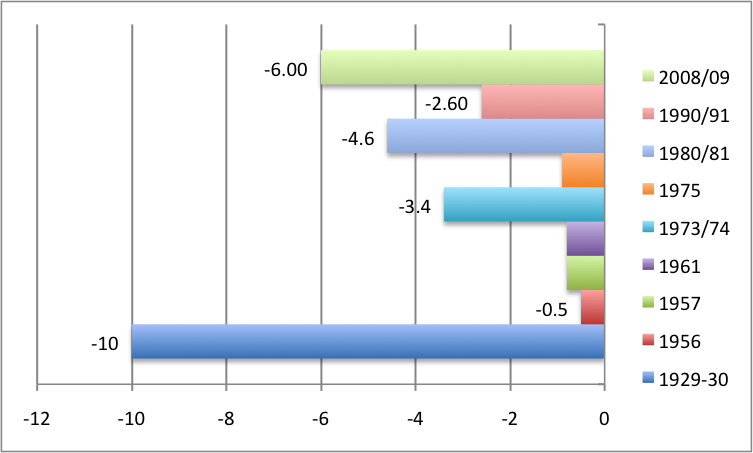 Different types of recession will influence the length, depth and effects of the recession. These are some of the different types of recessions. 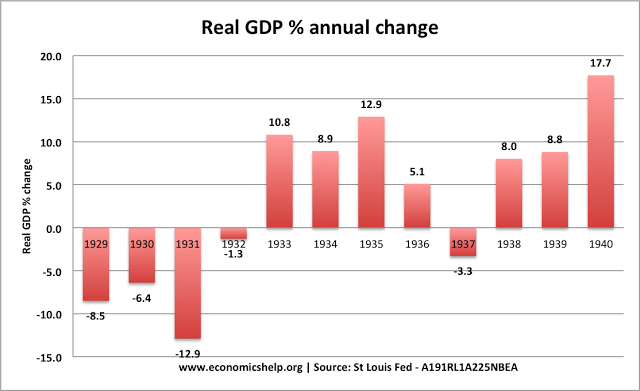 Many recessions occur after a previous economic boom. In the economic boom, economic growth is well above the long run trend rate of growth; this rapid growth causes inflation, and a current account deficit and the growth tends to be unsustainable. Also, an economic boom is often unsustainable, e.g. firms may be able to temporarily produce more by paying workers to do overtime, but this might not last. Also, in a boom, consumer confidence tends to soar. 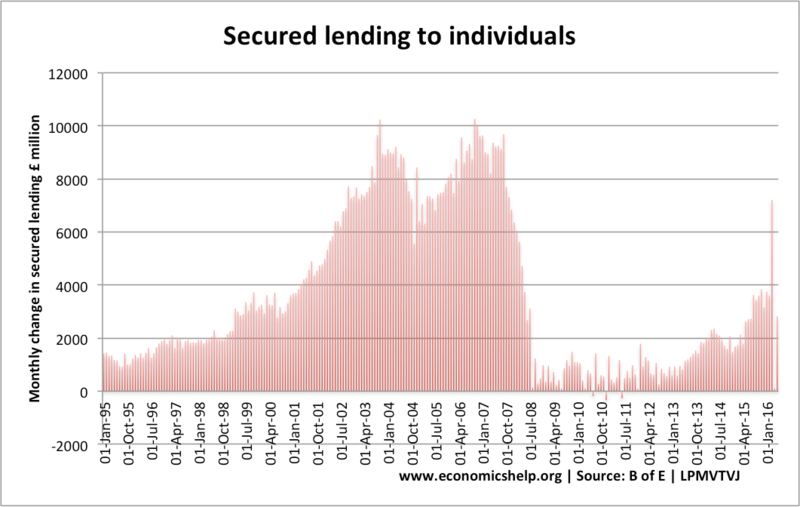 As a result, there tends to be a fall in the savings ratio and a rise in private borrowing to finance higher spending. 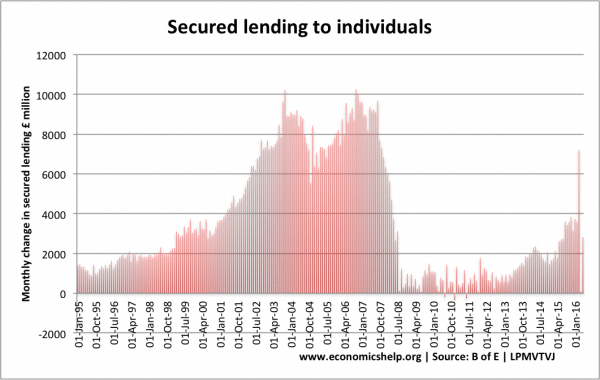 The economic boom is financed by rising debt. Therefore, when there is a change in economic fortunes, consumers radically change their behaviour, rather than borrowing they seek to pay off their debt and the saving ratio increases causing fall in spending. 1990-92 recession – following Lawson boom of the late 1980s. 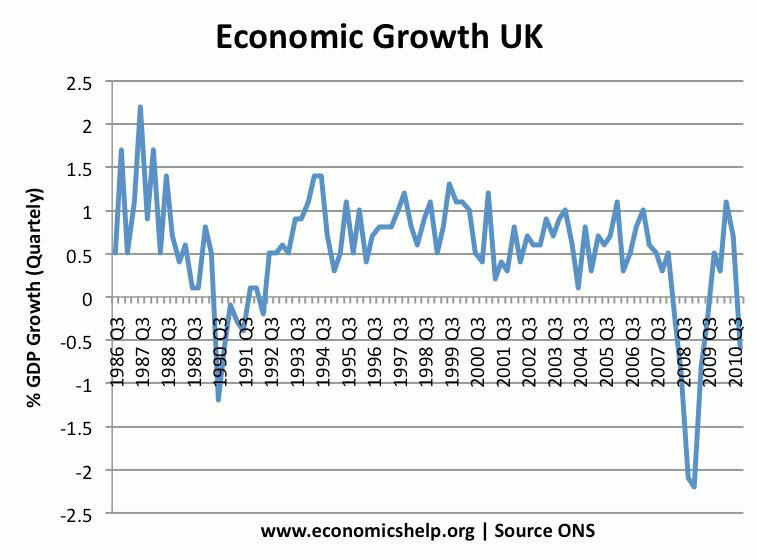 In the late 1980s, UK growth increased to over 5% (annual), causing inflation to rise to double figures. In response, interest rates were increased, house prices fell and consumer confidence collapsed leading to the recession of 1991-92. Can be avoided by keeping growth close to long-run trend rate and inflation low. A balance sheet recession occurs when banks and firms see a large decline in their balance sheets due to falling asset prices and bad loans. Because of large losses, they need to restrict bank lending – leading to a fall in investment spending and economic growth. Also, in a balance sheet recession, we also see falling asset prices. For example, a fall in house prices causes a decline in consumer wealth and increases bank losses. These are another factor which causes lower growth. 2008-09 recession. In 2008, bank losses led to a fall in bank liquidity and banks found themselves short of cash. This led to a fall in bank lending and it was difficult to get funds for investment. 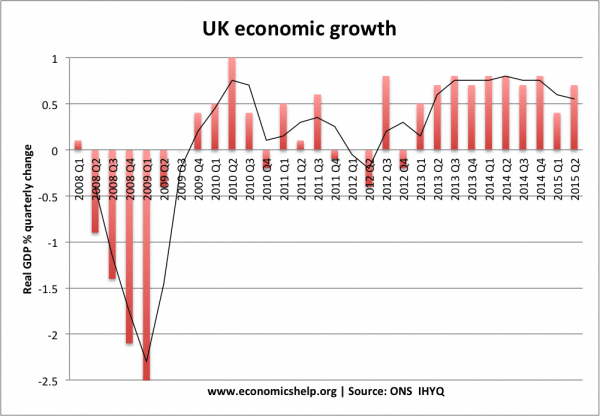 Combined with a collapse in confidence, the economy went into recession – despite interest rates being cut to zero. To avoid a balance sheet recession, we need to avoid a credit and asset bubble. Targeting inflation is not sufficient. A depression is a prolonged and deep recession, where output falls by over 10% and very high rates of unemployment. A balance sheet recession is more likely to cause a depression because falling asset prices and bank losses have a long-lasting impact on economic activity. A very rapid rise in oil prices could cause a recession due to the decline in living standards. In 1973, the world was highly dependent on oil. The tripling in the oil price caused a sharp fall in disposable income and also caused lost output due to lack of oil. Not very common. The world is less dependent on oil than in the 1970s. The rise in oil prices in 2008 was only a minor factor in causing 2008 recession. An unexpected event that causes a sharp fall in aggregate demand. For example, the short lived recession of 2001 (GDP fell only 0.3%) was partly caused by fall in consumer confidence as a result of 9/11 terrorist attacks (and also end of dot com bubble). 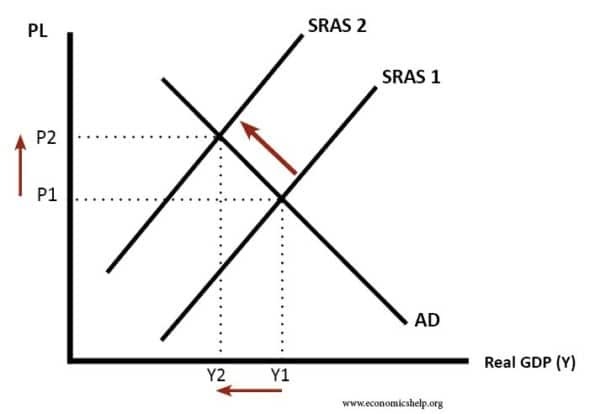 L shaped recession – refers to a period of stagnant recovery after initial fall in GDP. Even though technically the economy may have positive growth (e.g. 0.5%) it still feels like a recession because growth is very slow and unemployment high. 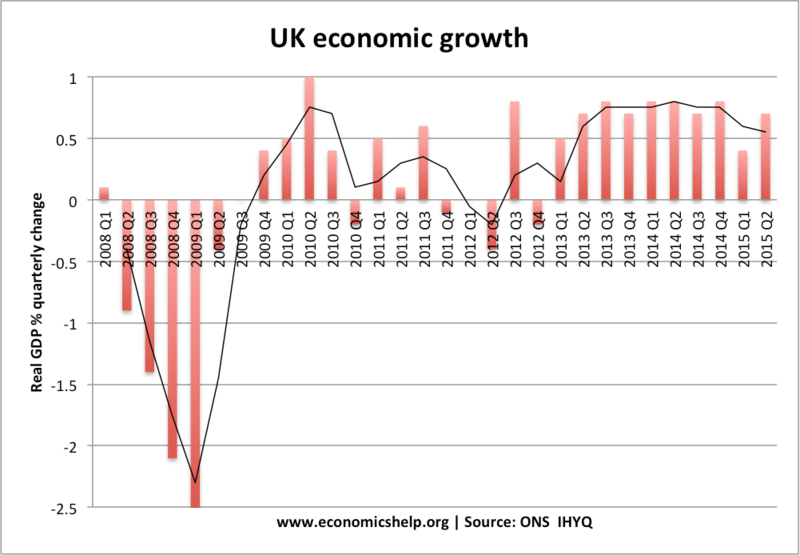 Source: ONS Total fall in GDP.